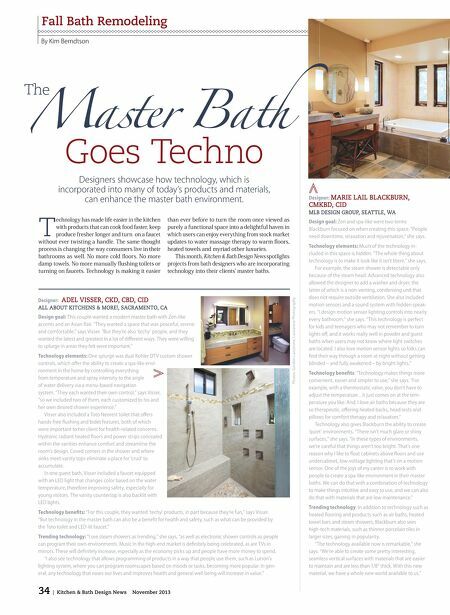 Fall Bath Remodeling By Kim Berndtson The Goes Techno Designers showcase how technology, which is incorporated into many of today's products and materials, can enhance the master bath environment. Designer: MARIE CMKBD, CID LAIL BLACKBURN, MLB DESIGN GROUP, SEATTLE, WA than ever before to turn the room once viewed as purely a functional space into a delightful haven in which users can enjoy everything from stock market updates to water massage therapy to warm foors, heated towels and myriad other luxuries. 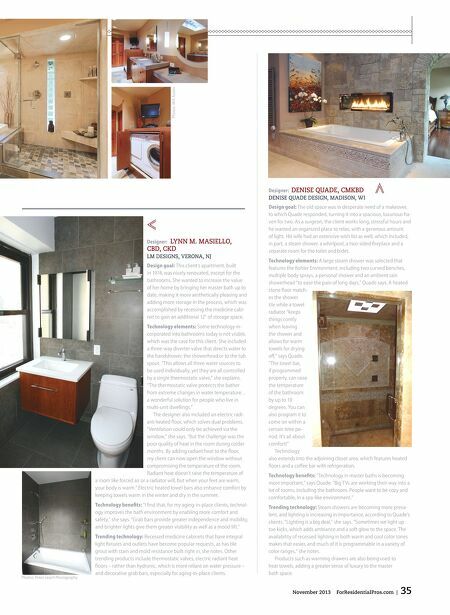 This month, Kitchen & Bath Design News spotlights projects from bath designers who are incorporating technology into their clients' master baths. ADEL VISSER, CKD, CBD, CID ALL ABOUT KITCHENS & MORE!, SACRAMENTO, CA Design goal: This couple wanted a modern master bath with Zen-like accents and an Asian fair. "They wanted a space that was peaceful, serene and comfortable," says Visser. "But they're also 'techy' people, and they wanted the latest and greatest in a lot of diferent ways. They were willing to splurge in areas they felt were important." ≪ Technology elements: One splurge was dual Kohler DTV custom shower controls, which ofer the ability to create a spa-like environment in the home by controlling everything from temperature and spray intensity to the angle of water delivery via a menu-based navigation system. "They each wanted their own control," says Visser, "so we included two of them, each customized to his and her own desired shower experience." Visser also included a Toto Neorest toilet that ofers hands-free fushing and bidet features, both of which were important to her client for health-related concerns. Hydronic radiant heated foors and power strips concealed within the vanities enhance comfort and streamline the room's design. Coved corners in the shower and where sinks meet vanity tops eliminate a place for 'crud' to accumulate. In one guest bath, Visser included a faucet equipped with an LED light that changes color based on the water temperature, therefore improving safety, especially for young visitors. The vanity countertop is also backlit with LED lights. Technology benefts: "For this couple, they wanted 'techy' products, in part because they're fun," says Visser. "But technology in the master bath can also be a beneft for health and safety, such as what can be provided by the Toto toilet and LED-lit faucet." Trending technology: "I see steam showers as trending," she says, "as well as electronic shower controls so people can program their own environments. Music in the high-end market is defnitely being celebrated, as are TVs in mirrors. These will defnitely increase, especially as the economy picks up and people have more money to spend. "I also see technology that allows programming of products in a way that people use them, such as Lutron's lighting system, where you can program roomscapes based on moods or tasks, becoming more popular. In general, any technology that eases our lives and improves health and general well being will increase in value." 34 | Kitchen & Bath Design News November 2013 Design goal: Zen and spa-like were two terms Blackburn focused on when creating this space. "People need downtime, relaxation and rejuvenation," she says. Photos: Gordon Lazzarone, Lazzarone Photography T echnology has made life easier in the kitchen with products that can cook food faster, keep produce fresher longer and turn on a faucet without ever twisting a handle. The same thought process is changing the way consumers live in their bathrooms as well. No more cold foors. No more damp towels. No more manually fushing toilets or turning on faucets. Technology is making it easier Designer: ≪ Technology elements: Much of the technology included in this space is hidden. "The whole thing about technology is to make it look like it isn't there," she says. For example, the steam shower is detectable only because of the steam head. Advanced technology also allowed the designer to add a washer and dryer, the latter of which is a non-venting, condensing unit that does not require outside ventilation. She also included motion sensors and a sound system with hidden speakers. "I design motion sensor lighting controls into nearly every bathroom," she says. "This technology is perfect for kids and teenagers who may not remember to turn lights of, and it works really well in powder and guest baths when users may not know where light switches are located. I also love motion sensor lights so folks can fnd their way through a room at night without getting blinded – and fully awakened – by bright lights." Technology benefts: "Technology makes things more convenient, easier and simpler to use," she says. "For example, with a thermostatic valve, you don't have to adjust the temperature…it just comes on at the temperature you like. And, I love air baths because they are so therapeutic, ofering heated backs, head rests and pillows for comfort therapy and relaxation." Technology also gives Blackburn the ability to create 'quiet' environments. "There isn't much glare or shiny surfaces," she says. "In these types of environments, we're careful that things aren't too bright. That's one reason why I like to foat cabinets above foors and use undercabinet, low-voltage lighting that's on a motion sensor. One of the joys of my career is to work with people to create a spa-like environment in their master baths. We can do that with a combination of technology to make things intuitive and easy to use, and we can also do that with materials that are low maintenance." Trending technology: In addition to technology such as heated fooring and products such as air baths, heated towel bars and steam showers, Blackburn also sees high-tech materials, such as thinner porcelain tiles in larger sizes, gaining in popularity. "The technology available now is remarkable," she says. "We're able to create some pretty interesting, seamless vertical surfaces with materials that are easier to maintain and are less than 1/8" thick. With this new material, we have a whole new world available to us."